The charms of Virus TI are contagious. Beg, borrow or… okay, please don´t steal one. Great sounds. Works as a plug-in. Works as a hardware controller. Works as an audio interface. Few synths have the mix-ripping sonic potential of Access´ range of synths. Over the years, we've watched (and salivated) as the original wedge-shaped desktop instruments have grown keyboards, gathered new functions, added effects, increased polyphony, spawned arpeggiators and so on. The Virus TI comes in three forms - as the aforementioned desktop wedge, as a 61-key keyboard and as the Polar, a three-octave affair, which is perhaps the most desirable design of all. The Polar is dominated by bright white LEDs, and despite offering the same feature set as the wedge and keyboard versions, it just adds a little more ‘wow´ factor. So, we hear you ask, ‘what´s ‘TI´ all about then´? Well, this is the seriously cool bit. Previously, unless you owned it as a Pro Tools or PowerCore plug-in, your Virus has existed only as an external synth, hooked up to your sequencer as a MIDI module. No longer. ‘TI´ stands for ‘Total Integration´ - this Virus works as a synth, a software plug-in, an audio interface, a MIDI interface and as a control surface for your sequencer. And it does all of this at the same time. Hold on to your hats. First and foremost, though, the Virus TI remains a synth module, and if you want you can use it exclusively in that way. As such, it comes armed with four RAM banks of 128 sounds, and 17 banks of ROM sounds, which means you have a little over 2,500 presets just to get your started. And two new waveforms are available in this model - there´s no question that on paper this is the best sounding Virus yet. The first waveform, Hypersaw, is a kind of über-sawtooth affair, layering multiple sawtooth waves on top of one another to produce sounds to which the word ‘power´ does no justice. Alongside this, you´ll also find the new ‘Wavetable´ oscillator that allows ‘step-like´ sounds, either as cascades, sweeps or sample-and-hold type sounds. Both waveforms are fabulous additions and bolster Virus´s awesome sound-making potential. The presets show the unit off wonderfully. If you make any kind of electronic music, there´s plenty for you here, from the warmest or growliest basses, to shimmering, ethereal pads, to searing leads and crunchy sequences. Other improvements on offer here include increased polyphony via Virus´ new dual-processor structure and a much-improved LCD backlit display with three soft knobs beneath, offering instant access to useful parameters for any preset loaded. Up to this point, all of this makes the Virus not only a wonderful synth to load into your rack - it will also enhance your live sound no end. But to use the Virus exclusively on its own is to deny yourself the sheer joy of connecting this monster to your computer. The unit ships with a software installer that loads the software plug-in version and audio drivers at the same time. Installation is utterly painless. Once you´ve installed the software and rebooted, connecting the supplied USB cable is all that remains. We booted Logic, and after the AU Manager took a moment to recognise it had a new friend to play with, we were in. All you need do then is select the plug-in from the ‘Access´ submenu of virtual instruments and you´re away. A fully integrated Virus awaits you, with the synth engine broken down into 10 pages, which take you through from the oscillators at the beginning to the effects and routing options at the end. 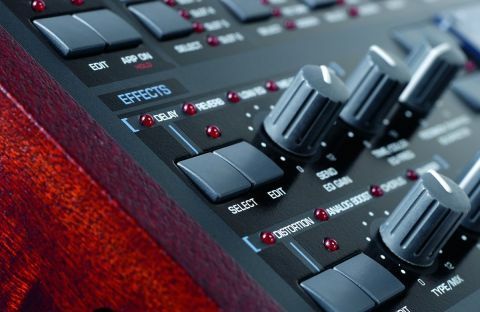 Each stage is well-designed and unfussy, and the super-cool thing is that you can actually use the Virus unit itself to act as a controller for the plug-in. When it comes to writing automation this is so much more enjoyable than reverting to your mouse, and it means tweaking of several parameters at once becomes a serious possibility. Each page becomes almost self-explanatory when editing your sounds. There was always the risk with the Virus that as new functionality was added, the physical surface of the instrument would become cluttered and fiddly to use. Any such worries evaporate with the software version, and we're certain that Access will use the hard/software approach as a benchmark for future products. No sooner have you caught your breath than the Virus presents its next treat. You can select the unit as your audio interface, so that all audio routes into and out of the unit itself. Obviously, there are no XLR inputs on the back, but if you have any kind of channel strip or preamp, this means that you can record any and all instruments through the Virus´s192kHz, 24-bit converters en route to your computer. Two analogue and two S/PDIF inputs are available, so it is at last possible to make the Virus the centre of an all-digital studio. The new Virus is impossible to dislike. So many of us run our studios in software alone and yet this unit is so desirable you´ll be forced to at least reconsider your new-found sleek, minimalist approach. Adding something to your setup that costs £1,200 might look like quite an outlay, but right off the bat you get a hardware synth, a software equivalent, an audio interface, a MIDI interface and a control surface. And this is before you´ve factored in the sounds which, were they hooded youths, you´d immediately issue with ASBOs. Access hasn't rested on its laurels. Despite the success of the Virus range up to this point, it's gone back to the drawing board for the TI, and we hugely respect them for coming up with so complete a solution here. An extremely desirable piece of technology.